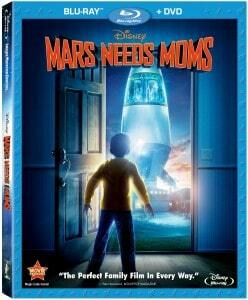 On August 9th, Disney released Mars Needs Moms on Blu-ray 3D and Blu-ray 2D, as well as on regular DVD/Digital Combo. I missed my opportunity to see Mars Needs Moms in theatres, so I was very pleased to be able to receive a copy from Disney for home viewing. Mars Needs Moms blew me away before I was even 10 minutes into the movie. The lines of the animation are crisp and sharp, and the colors are vibrant and just pop right before your eyes. We watched the 2D version, and I can only imagine how incredible the 3D experience would be, even if viewed only from my very own living room. I’m actually really glad that my daughter and I watched this at home; I got very caught up in Milo’s adventure on Mars and started bawling in several places. For any emotional moms out there: you will want to have some Kleenex on hand. I can’t imagine anyone making it through this movie without choking up even just a little! Mars Needs Moms is the type of movie that has something in it for everyone in the whole family. For the dads, there is a sci-fi story line of aliens coming to Earth to abduct a mother worthy of raising the Martian females. I think the dads and teenage boys will especially love Gribble, though mothers will have a soft spot for him as well since he’s without one. For the moms, there is the unconditional love between Milo and his mom. Milo will do anything it takes to save his mom from being used up and then discarded by the Martians, and Milo’s mom would do the same for her son. For the impressionable young women in the family, there is Ki, a Martian female who is obsessed with Earth pop culture–especially a TV show that appears to be set in the 70s. She is a rebel, and has found flaws with the leadership (the evil Supervisor who looks slightly like E.T. to me when he wears the wig; just watch and maybe you’ll see what I mean) and wants to change it. She can also speak perfect English, and teams up with Gribble and Milo to save Milo’s mother. Younger kids, both boys and girls, will relate to Milo, who hates broccoli, taking out the trash, and unfortunately, sometimes his mother. I also found the Martian culture fascinating. The planet is run by females, and the males have been banished deep beneath the surface. When new males are hatched, they are essentially shot down a garbage shoot, where the older males then raise them. They appear pretty simple, but are actually the perfect caregivers for the species. This is why Mars needs Earth moms, though. They got rid of the men, and now need their young females to be raised by robots programmed to care and discipline like the chosen Earth mom. I would definitely have welcomed more background on how Mars came to be the way it is; the clues are subtle, but at least they are there. This is definitely a Disney movie worthy of any fan’s collection. I’ve already watched it twice, and can’t wait to watch it again and again. Would love to win this! Thanks for the opportunity. Have a great week! Oops..first coupole entries had [email protected] should be one l in sluka. Thank you! MY klids love this movie I think they’d love to get it! Awww August 9th was my daughters birthday! I’d love to win this – thanks for the chance! My kids would love to watch this movie. We love Disney movies. Thanks for the chance!